Active Weighing Solutions has recently installed an Automatic FIBC Filling Station with Double Stacking capability for a customer in country Victoria and another unit is currently in their workshop destined for a client in Adelaide handling bi-carb soda. This unit is available for viewing in the Active Weighing Solutions workshop right now. The filling station can achieve bagging rates of up to 70 TPH (70 x 1 tonne bags per hour) and 20 TPH when double stacking 500kg bags depending on the product being handled. With the units Trade Approved Platform Scale (overhead), an accuracy of +/- 0.5kgs is typically achieved when filling 1 tonne bags, but again, this is dependent on the product being handled. FIBC’s do not therefore need to be check weighed or ‘topped up’ after coming off the Filling Station. The Active Weighing Solutions Automatic FIBC Filling Station can be supplied with an optional Consolidation Table. This is a vibrating table that allows for the consolidation of the product into the bag, which will ensure the stability of a filled bag when placed onto the pallet. The functionality of this option is controllable and can be set to be turned on or off, run during the early stages of filling, run prior to completion of filling or to run the ‘Pack Down’ option for difficult product. 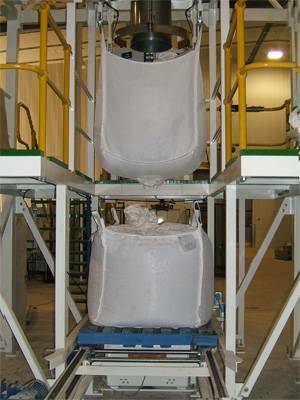 If a bulk bag is not consolidated, often during transportation product will compact due to the vibration. This can cause the securing straps to come loose and cause a potentially dangerous situation during unloading. The consolidation of the product using this option prepares the shape of the base of the FIBC, eliminating the risk of this situation occurring. The ‘U’ Shaped Platform of the Active Weighing Solutions Automatic FIBC Filling Station provides easy access and is designed to allow operation by a single operator, but to achieve the highest rates two operators may be required. The pallet dispenser is capable of handling many different pallet types. A slip-sheet applicator can also be included to apply a cardboard sheet to the pallet prior to the FIBC being placed. The pallet dispenser is also capable of re-stacking pallets after the FIBC has been filled, a feature used when the full bag is handled without requiring a pallet. The units feed conveyor allows a single pallet to be driven to the filling station. During the filling operation a second pallet is driven to the intermediate station ready for the next filling operation. This system reduces the time between bag changes and increases throughput. To control dust, the unit utilises a controlled aspiration sequence used during the filling and unloading operations of the FIBC. During filling, the Radial Feed Gate aspiration is turned off and the aspiration is through a plenum that stops dust entering the flexible. This ensures the dust is extracted correctly through the system. During the unloading operation, aspiration is through the main filling tube, which draws air back through the plenum spouts. The lifting frame is infinitely adjustable with individual brakes and photoelectric eyes provided on each drive motor. An automatic levelling mechanism (manual levelling function exists within the Operator Interface) and automatic frame unbalance detection are also incorporated in the lifting frame. A manual override of the bag hook release is available, with password protection. In manual mode, the accumulating conveyors can be started and will run until turned off or the photoelectric eye detects an FIBC or pallet. In automatic mode, the filled FIBC’s will move forward to the next available position, i.e. as the fork lift removes filled FIBC’s, the others move forward. The conveyors are reversible to allow easy calibration of the Trade Approved Platform Scale. Light curtains are available as an option upon request and are fitted to the Automatic FIBC Filling Station ready in the Active Weighing Solutions factory. Please contact Nigel Saul on 0403 060 001 to arrange a time see the Active Weighing Solutions Automatic FIBC Filling Station in operation.